Promising band from Toulouse making delicately lyrical pop. In 2013, three members of the Toulouse-based band Kid Wise had a life-changing experience: they met Mathilda Cabezas, a former film student who had started a project called After Marianne but had yet to find the right musicians to embark on this adventure with her. 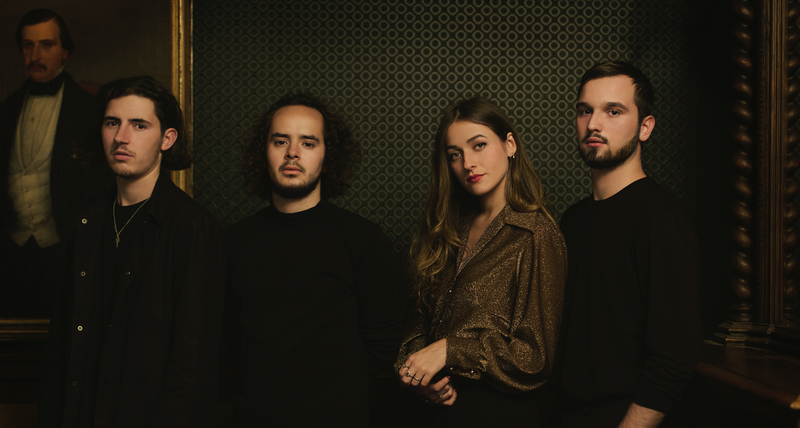 She played her first demos to keyboardist Augustin Charnet and they immediately bonded and they decided to join forces with two of Augustin’s bandmates from Kid Wise – drummer Léo Faubert and guitarist Théophile Antolinos. After Marianne had finally become a four-piece. Last October, they released their debut EP, It’s a Wonderful Place To Be (Over). Its tracklisting was not selected at random, but carefully built around the concept of a love story, developed over six songs. With a voice both mysterious and poignant, Mathilda floats through the soundscapes created by the three boys. Their otherworldly music has a minimalist approach, reminiscent of Daughter, Bon Iver, James Blake, Son Lux or Sigur Rós – all of whom are listed in the ‘Artists we also like’ section on their Facebook page. At the centre of their EP lies ‘Love Is Just a Game’, a charming duet with French crooner/popstar Julien Doré, whose melancholy voice intertwines with Mathilda’s. On this impressive first release, After Marianne show their skills as songwriters and arrangers, using eerie backing vocals, a brooding piano, atmospheric keyboards and cinematic strings. Their song ‘Take Care’ sums up exactly what they are doing: taking care of our minds with their gorgeous music.